The advent of the less-invasive laparoscopic approach to surgery has made bariatric surgery safer overall. However, bariatric procedures such as Lap Band surgery, gastric bypass and sleeve gastrectomy are still serious surgical procedures with inherent associated risks. 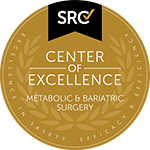 To minimize the risk of experiencing a surgical complication, it is critical for individuals to choose a highly qualified and trusted bariatric surgeon to perform their weight loss surgery. Also, although bariatric surgery can be an effective tool in helping individuals suffering from obesity change their life for the better, the chosen weight loss procedure must meet a patient’s various anatomical and metabolic requirements for it to be successful. Thus, it is important that a patient choose an experienced surgeon who is able to determine which weight loss procedure is appropriate for his or her unique metabolic needs, who has a high patient satisfaction rate and who will maximize the patient’s chances of achieving weight loss success. Finally, attaining sustainable weight loss is a journey that is not always easy. 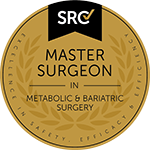 Patients benefit from choosing a bariatric surgeon who is compassionate and provides additional tools outside of surgery to help individuals succeed in their weight loss objectives. Training: Dr. Kuzinkovas has completed extensive training in laparoscopic bariatric surgery. In addition to obtaining his Bachelor of Medicine, Bachelor of Surgery degree and his Doctor of Medicine degree, Dr. Kuzinkovas also completed a postgraduate research fellowship in laparoscopic surgery and surgical immunology under Professor Markus Büchler, a globally renowned upper-gastrointestinal and pancreatic surgery specialist. In addition, Dr. Kuzinkovas completed an advanced surgical training at West Midlands University Teaching Hospitals in the United Kingdom. Accreditation: Sydney bariatric surgery specialist Dr. Kuzinkovas is highly accredited. He is a Fellow of the Royal Australasian College of Surgeons (FRACS) as well as a member and a Fellow of the Royal College of Surgeons of Edinburgh (MRCSEd, FRCSEd), which means that he has satisfied the rigorous criteria regarding surgical training, expertise and ethics established by these distinguished accreditation authorities. Dr. Kuzinkovas has also earned the distinction of being a Bariatric Surgeon of Excellence, as certified by the Surgical Review Corporation. Experience: Thanks to his wide breadth of experience in all forms of bariatric surgery, Dr. Kuzinkovas is able to identify which weight loss surgery procedure is appropriate for each individual, given the patient’s unique anatomical needs and weight loss goals. He has performed more than 5,000 laparoscopic surgeries over the span of his career, thus far. Not to mention, Dr. Kuzinkovas is extremely experienced in performing revision bariatric surgery, which is often more complex than the initial surgical procedure, due to the degree of tissue manipulation and scarring that has already occurred. Hospital Privileges: Having hospital privileges at highly respected medical institutions is important on two levels. First, because bariatric surgery is performed in a hospital setting, it is important that the bariatric surgeon have admitting privileges at the leading hospitals in the area. Second, earning hospital privileges indicates that a hospital review committee comprised of medical professionals has reviewed the surgeon’s body of work and has granted him or her operating privileges at their establishment. Dr. Kuzinkovas has hospital privileges at premier institutions in Sydney including St. George Public and St. George Private (the latter of which has obtained Centre of Excellence status) as well as Sutherland Public and Kareena Private Hospitals. In addition, hospital personnel at these hospitals are often so impressed with the surgeon’s work that they refer their family and friends to Dr. Kuzinkovas for bariatric surgery care. Patient Satisfaction: Choosing to undergo bariatric surgery can be a positive life-changing decision. However, it is not one that should be made lightly, as weight loss surgery is a major operation. Thus, it is very important that a surgeon who has a high patient-satisfaction rate - such as Dr. Kuzinkovas - perform bariatric surgery. Dr. Kuzinkovas’ bariatric patients are so thrilled with their results as well as the personalized, one-on-one care they receive that they refer their friends and loved ones to the Sydney bariatric surgery specialist for weight loss treatment. To get a better idea of the weight loss results that Dr. Kuzinkovas’ patients often achieve, please visit the photo gallery for before-and-after photographs, or follow us on Facebook and Twitter. Comprehensive Support: Aside from providing his surgical expertise, Dr. Kuzinkovas provides detailed information about the weight loss process before bariatric surgery and thorough follow-up care after weight loss surgery to help each patient achieve the best weight loss results possible. Also, the team at Advanced Surgicare understands that to lose the excess weight and keep it off in the long term, individuals must learn how to make healthier lifestyle choices for the rest of their lives. To help patients achieve their long-term weight loss goals, the team checks in with each patient every one to three months during the initial year after bariatric surgery, and every six months thereafter. In addition, the Advanced Surgicare nutrition specialist, Natalie Linton, and the fitness specialist, Renee Kounis, help patients get and stay on the right track by providing nutrition and exercise advice, both before and after bariatric surgery. Finally, psychological counseling is also available, if needed. To be successful in your weight loss goals, both immediately after surgery and over the long run, you need a talented bariatric surgeon with extensive experience, proper follow-up care and a team of professionals to reinforce your healthier diet and exercise habits. Without these, it is easy to stop following your postoperative diet and exercise program and regain the weight you have lost. When this happens, revision bariatric surgery is often necessary. To lose the excess weight and keep it off the first time around, bolster your efforts with an effective support team. To schedule an appointment with Dr. Kuzinkovas and see for yourself why Dr. Kuzinkovas and the Advanced Surgicare team are the right choice, contact Advanced Surgicare Clinic by calling 1300 551 533.